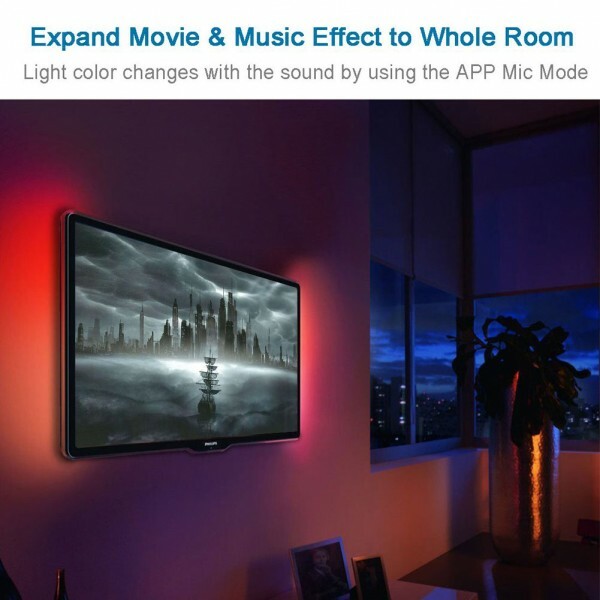 *3 Control Mode -- [Alexa Mode] Speak to Amazon Alexa Echo, you can ask the light strip to turn on/off, change colors or dim. 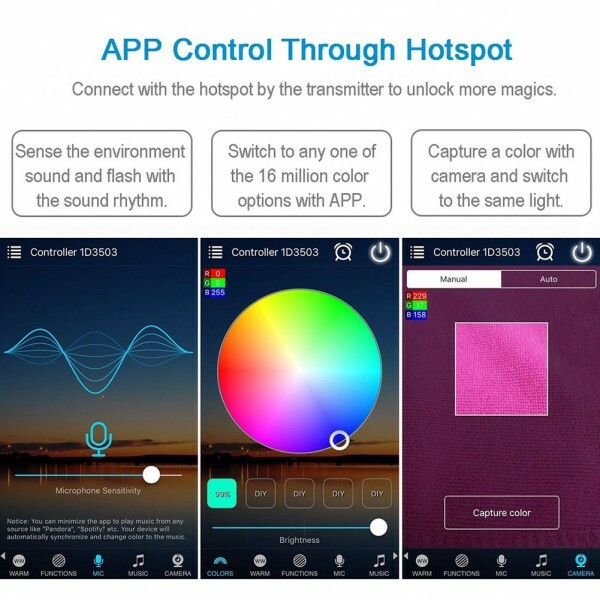 [WiFi Mode] It allows you to control the light with your smart phone through ""Magic Home Pro"" App. 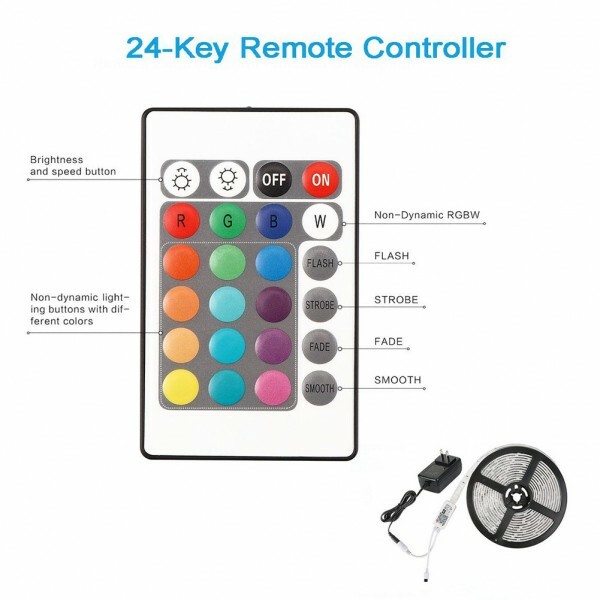 [Remote Controller] You can also control the LED light with the 24 keys IR remote controller. 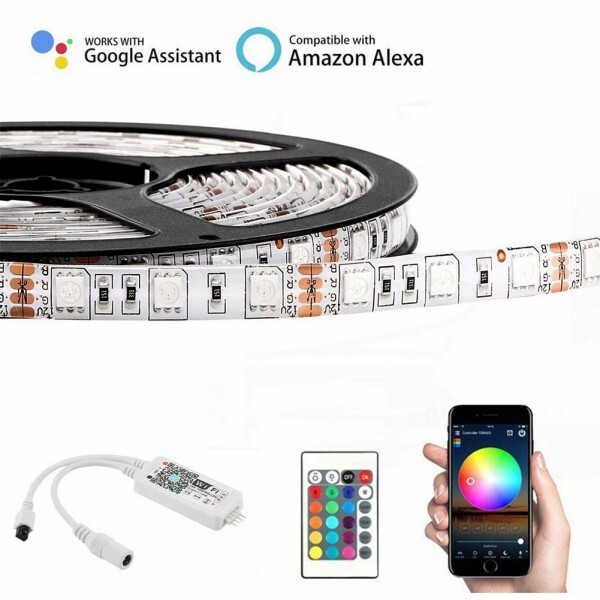 *16 Million RBG Colors -- Built-in 5050 SMD LED flexible lighting strip, it can achive in 16 million colors and be adjusted from 1% to 100% brightness by your smartphone. Best for decorating your home, especially great for holidays and events like Christmas, Halloween, Party. 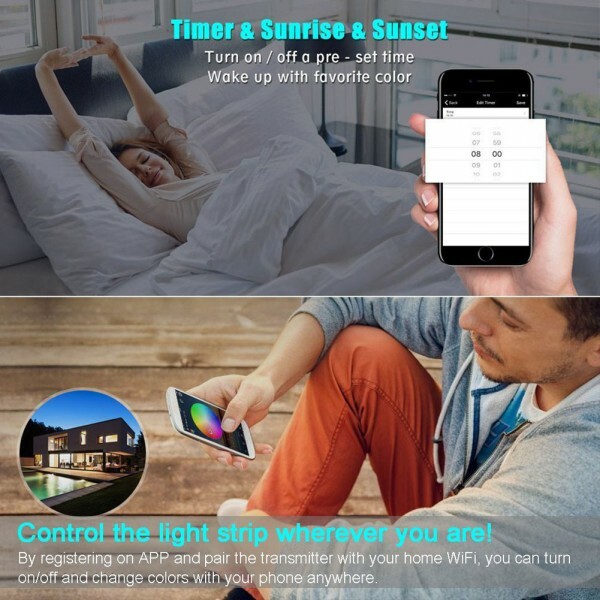 Sync with Music & Timer mode -- The light can flash to sync with music melody when you control with your phone. 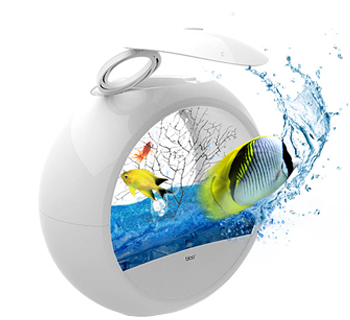 You can make appropriate schedule for different occasions, shuch as wake-up or bedtime mode, party mode, etc. 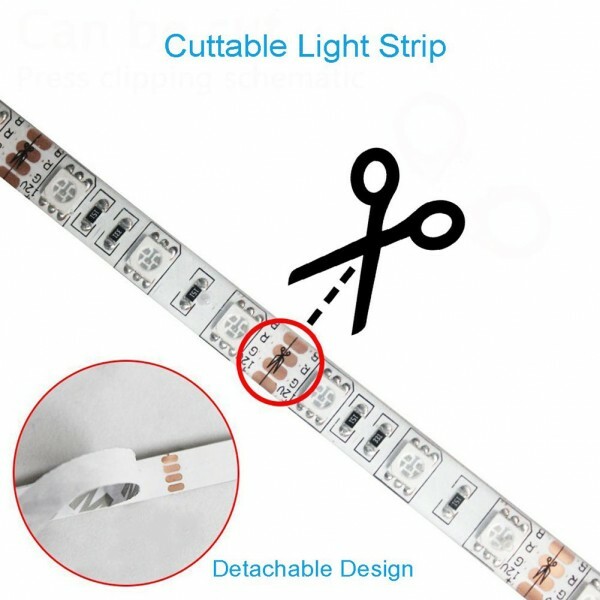 *Dettachable & Waterproof -- This IP65 Waterproof LED light strip is cuttable and re-linkable along the cutting marks. You can stick it on outdoor occasions, no worry about the rain splashing. 16 Miillion colors light selection Adjustable temperature DIY allows you create custom colors,modes and speed Brightness control: From 1% to 100% Sound volume: From 1% to 100% Speed: From 1% to 100% Sync with music and sounds & Timer Mode 1 app can be used for multi strip lights; 1 account can be used on multi phones; Control multi strips at the same time. 1. The connect must be in towards to the arrows before you plug in the power supply. 2. When you use the remote controller, you should take aim the IR accepter, otherwise it can't work well. 3. Don't left them on the spool when you testing them more than 2-3 mins.They need to dissipating heat. I purchased to backlight my TV, i bent the strip and the corners to follow the tv backplate, but now the blue leds in 4 sections dont show. Luckily the strip was long enough to cut it, and use from the other end, without bending, which now serves the purpose. The product works very well. 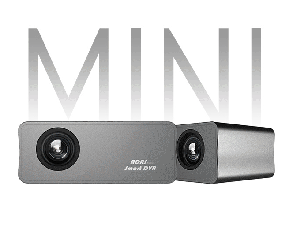 You have near infinite colour control. The remote is basic, the phone app has a lot more colours and both work well. 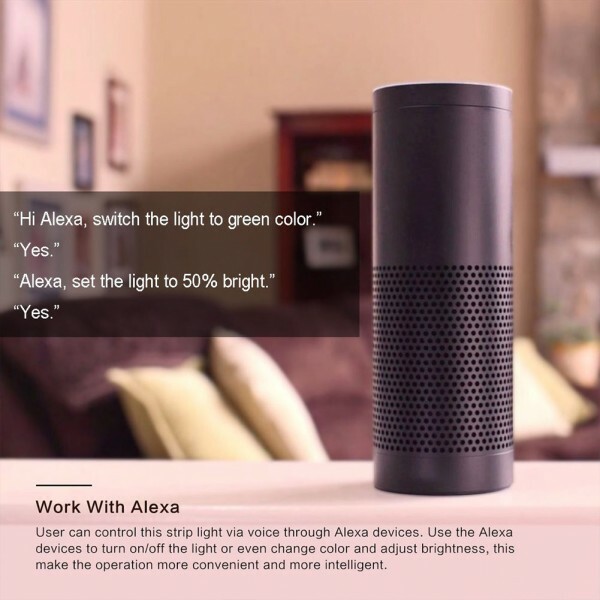 Alexa integration was easy, and this device works very fast - i have barely finished my command and it does what was asked. Philips Hue lights take longer to respond, as a comparison. It does everything advertised and does it well. My only gripe is that the glue on the back of the lights is of poor quality. I had stuck mine on the underside of the kitchen bench, so i did have gravity working against it. Nonetheless, I expect it to hold up. I even provided some support with blu-tack. It fell off in a week or so. I kept sticking it back with more blu-tack, but thats not working any more. Need to fix it with some strong two-sided tape now.